We have just returned from Greece, and as you might imagine, the situation this year provided inevitable challenges to mounting passTRESpass. Despite the hurdles, we are pleased overall with the impact our project continues to have on refugees in Athens. We had 5 American and 1 Greek facilitator this year. Irene Siegel, Lorene Bouboushian, and Karl Cooney were new to the project in 2015. Their dance, language, and logistical skills were a huge asset to our work. Despina Stamos, Panagiotis Andronikidis, and Jill Woodward returned to the project. A steady influx of refugees from Syria and other places continued to arrive daily in the midst of one of the worst European financial meltdowns since World War II. We touched many more people but not always in the lengthy workshop process that we’ve done in previous years. 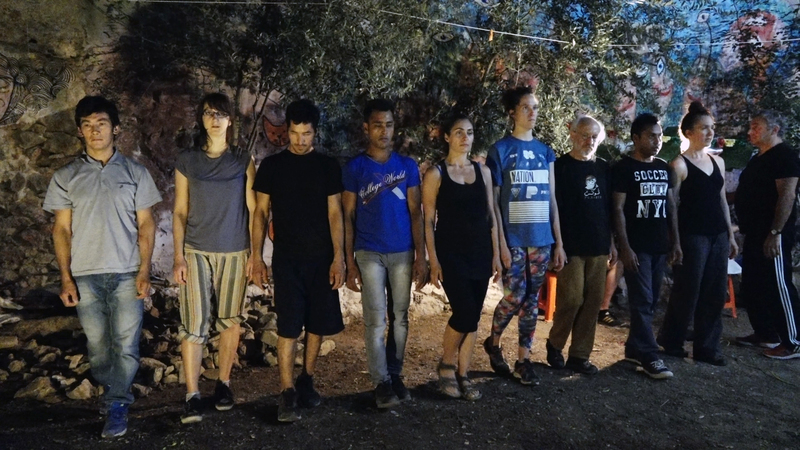 We gathered a group of participants who joined us as we created performances in various plazas, known as platias, in Athens. 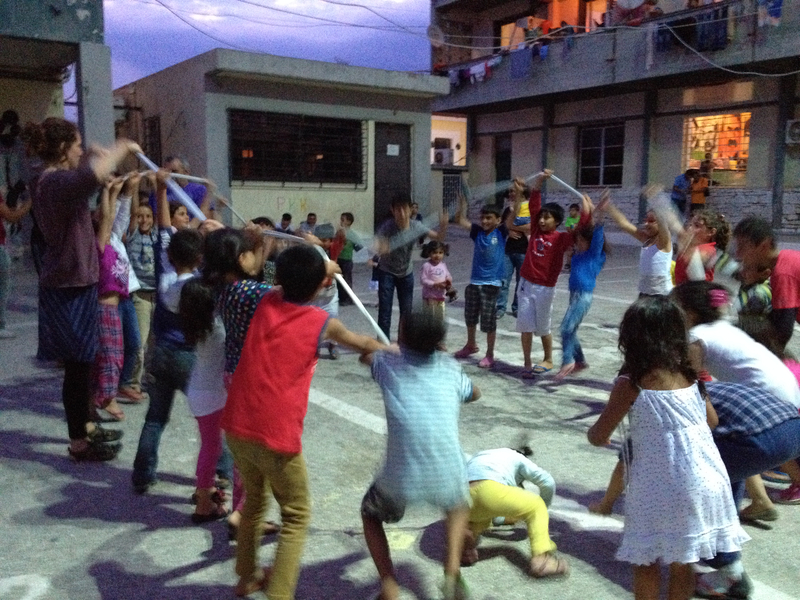 We performed at 8 locations where immigrants tend to gather, including one refugee camp just outside the city. This compound was a temporary home to hundreds of recently arrived Syrians, including around 150 children. When our dance was finished we were delighted to have the children and adults share some of their own movement games with us. Because Irene speaks Arabic and French, we were able to communicate better with refugees than ever before. Lorene’s background as a children’s dance educator was immensely helpful as we found ourselves interacting more and more often with families and children. In all of these locations, we incorporated the audience members into our dances, and invited them to join us at the next place. A few refugees and Greek community members had the time and wherewithal to join us in building a performance piece. We were scheduled to present work at the Athens Anti-Racist festival, but the festival was cancelled because it was a direct conflict with the last minute unprecedented referendum announced by the government. 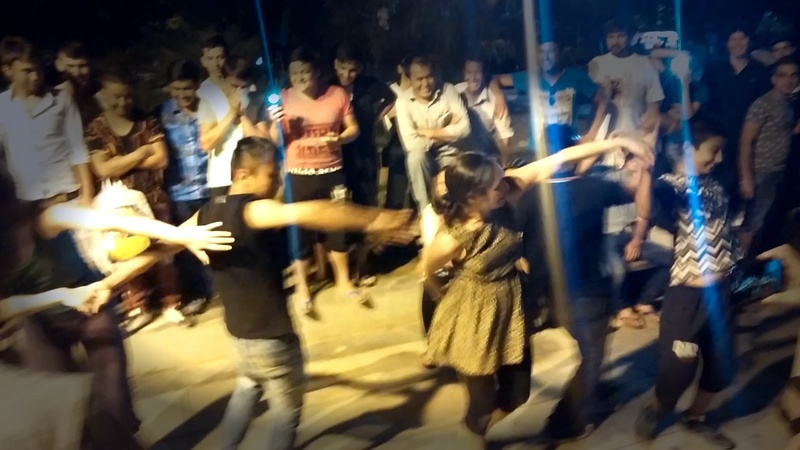 Instead, we joined with a local theater group and presented a 30 minute dance piece for an audience at a cultural center the night before the referendum. We are all improvisers in our movement work, and we drew on those skills to adapt our project and improvise logistically everyday throughout the three week workshop period in Athens. Even people we touched only briefly told us how much our presence meant to them, and we are extremely gratified that we were able to have those interactions. We look forward to sharing our more of work through video in progress, and meanwhile if you’re interested you can see our final performance below. Categories: art, dance performance, installation/intervention, street performance, dance market research, public art, site-specific improvisation workshop | Tags: Afghan refugees, Athens, dance, dance workshop, despina sophia stamos, irene Siegel, jill woodward, Karl Cooney, Lorene Bouboushian, modern dance, modern dance awareness society, Panagiotis Andronikidis, passTRESpass Athens immigrants, passTRESSpass, performance, refugees, site-specific dance, Syrian refugees | Permalink.